Sometime last year, Hotstar chief executive Ajit Mohan took to Facebook to write about a new feature of his video-streaming service. The post earned him 15 likes. There were no comments or shares. Clearly, Mohan wasn’t making waves on the world’s largest social networking site. 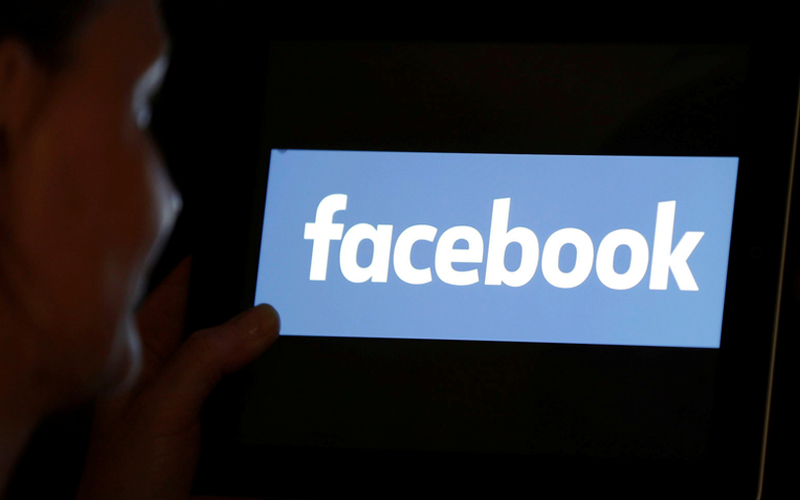 But from early next year, his imprint will most certainly be visible on Facebook as he takes over its Indian operations. That post attracted 239 likes, 121 comments and six shares till the time of publishing this report. But for Mohan, the most important number when he joins Facebook in January will be its 250 million users in India - the social network’s biggest market by number of users. A number of challenges await the Wharton MBA graduate in his newly-created role of managing director and vice-president for Facebook India. For starters, he needs to repair Facebook’s relationship with the Indian government. Things started to go sour in 2015 when its Free Basics programme was banned in the country on the grounds of violating net neutrality principles. More recently, the fallout of the Cambridge Analytica imbroglio has had the Indian government worried about possible election manipulation via Facebook. The Central Bureau of Investigation is currently investigating the company's role in Indian user data being shared with third parties. Add to that the data localisation and privacy concerns and official warnings over fake news that have delayed the rollout of the payments service piloted by WhatsApp, the Facebook-owned instant messaging platform which has more than 200 million users in India. All these factors possibly explain why Facebook took nearly a year to find a replacement for its previous India head, Umang Bedi. 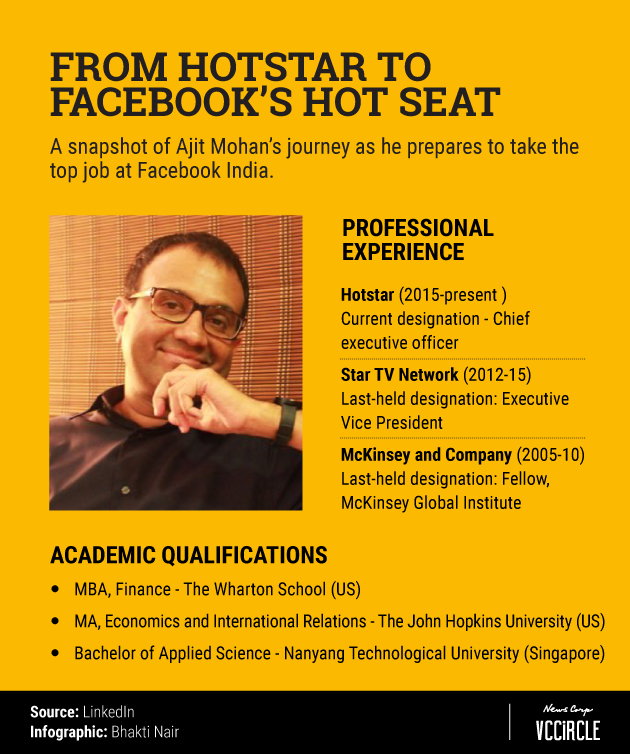 As Mohan readies to take on these challenges at Facebook, he will draw from his experiences of building Hotstar from scratch. Mohan worked as a management consultant with McKinsey and Company for more than five years before joining as senior corporate vice-president at Star India in early 2012. He moved to Hotstar in late-2015, a few months after the streaming platform was launched by Star Network as a standalone entity. With Mohan at the helm, Hotstar has grown exponentially over the past couple of years as cheap mobile data has fuelled a boom in video streaming. Hotstar, which competes with the likes of Amazon Prime Video and Netflix, has built a huge subscriber base while operating on a freemium model. Advertising currently drives the bulk of its revenue. While Hotstar is not in the habit of revealing the number of its premium subscriptions, Mohan recently said that Hotstar draws 150 million monthly active users. Hotstar has also been the most downloaded app in India during the last two years, according to data from App Annie, a platform that tracks app metrics. During the Indian Premier League, the annual cricket extravaganza, Hotstar managed a global record of 8.26 million peak concurrent viewers and 26 million viewers overall for the live telecast of a single match. It’s clear then that Mohan is accustomed to seeing big numbers. Even so, Facebook represents a different kettle of fish. In addition to rebuilding relations with the government, he will also have reorganise teams in-house in coordination with Facebook’s other products such as WhatsApp, which has been struggling to find an India head, and photo-sharing service Instagram, whose founders resigned on Monday. And all of these are immediate challenges.